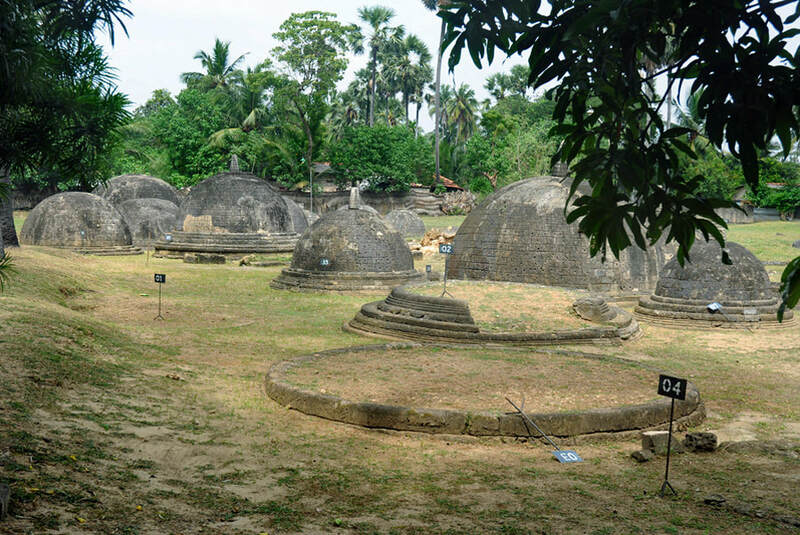 Kandarodai, famous for its group of “mini stupas”, is by far the most important excavation site on Jaffna Peninsula. It’s located 9 km north of Jaffna city, as the crow flies, and 2 km west of Chunnakam. Chunnakam is in the centre of the peninsula’s most populated division in its western part, the historical region called Valikanam, of which Jaffna situated at the coast is now the most important city. Besides Anuradhapura, Kandarrodai was one of Sri Lanka's most important settlement areas in prehistorical times. In the early historical period, the peninsula's most ancient Buddhist dagabas were constructed here, in surprisingly large numbers. The historical explanation of this picturesque complex steepedis still highly controversial. Or to put it positively: Kandarodai remains to be a mystery. For heritage tours to Jaffna, it is a must-see. There are confusingly many names and spellings in use for designating Kandarodai. “Kandarodai” is the Tamil name of the hamlet where this most significant ancient monument of Jaffna Peninsula is situated. It’s also spelt “Kantharodai” or “Kantarodai” or “Kanterodai”. “Kadurugoda” is the modern Sinhala name, which is also mentioned in an ancient inscription. Another spellings is “Kandurugoda”. Occasionally, though not often, it’s also called “Kadurugodai” in northern Sri Lanka. Etymologically, both the Tamil and Sinhala names could derive from the Sinhalese term “Kandavurugoda”. To the Portuguese the site was known as “Kandara kudde”. “Kandara” in Pali means a stream or a watery spot. A historical name known from ancient chronicles is surmised to be “Kadiramalai”. In English, this term is sometimes transcribed as “Kudiramalai”, the “u” spoken as in “hut”. A rare spelling of the same name is “Kudirimale”. Even more confusing: There is a another place of this name, “Kudiramalai point” at the northwestern shore of Sri Lanka, in the Wilpattu region, just to the south of the island of Mannar. Both regions, Jaffna Peninsula as well as the coastline near Mannar, claim to be the “Thambapanni” of the ancient Pali Chronicles, where the legendary first Sinhalese king, then Prince Vijaya, once landed with his companions. Just as both regions are also presented as the landing place of the Bo-tree two centuries later on. Be aware, there is not only a confusion of names but also a corresponding scission of historical narratives concerning this highly important heritage site. This is due to an ongoing political controversy between Tamil and Sinhalese nationalistic historians. Therefore, talking about Kandarodai alias Kadurugoda with Sri Lankans, you can easily put your foot in your mouth. Both sides agree, that the circulur tumuli found at the surface of Kandarodai were small Buddhist stupas, presumably from various centuries of the first millennium. But here the consensus ends. 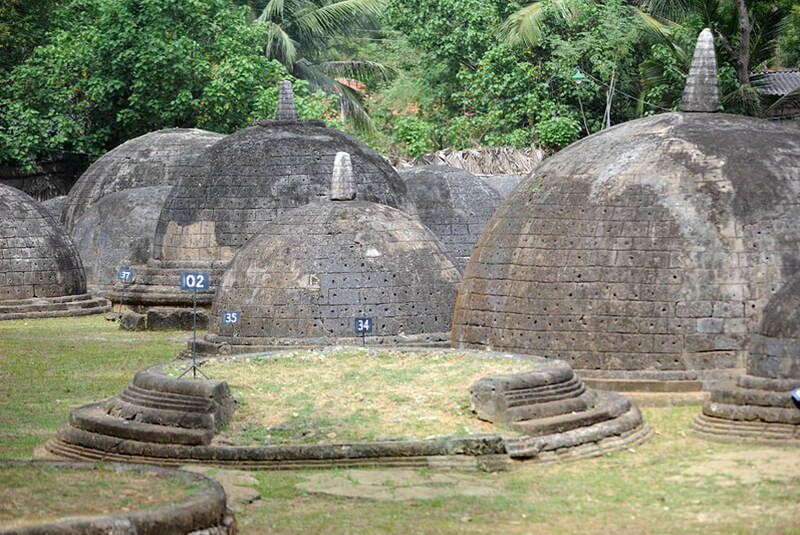 The Tamil nationalist's narrative is as follows: These stupas were burial places of local Tamil monks. In the first millennium, Buddhism actually played an important in Tamil history, particularly in mainland India. And Tamils played a very important role in distributing Buddhism to other regions in tropical Asia, since Buddhism, though never dominating the Tamil culture, was favoured by Tamil merchants and seafarers in particular. So far so good. But according to nationalistically biased Tamil historians, Buddhism, too much associated with the Sinhalese culture, is said to have played only a secondary role in Kandarodai. Tamil nationalists stress that Kandarodai had been a burial place of a great megalithic civilisation. They insinuate that the stupa buildings are just a kind of “buddhicised version” of that older megalithism. The crucial point of this historical narrative is: Megalithism is often identified with an early stage of the Dravidian culture all over the Dekkhan (the Indian peninsula). Most megalithic burial places are found in India’s state of Tamil Nadu, but there are plenty of them in all southern and eastern parts of the Indian peninsula, some of them along the western coast, but almost none in the Gangetic plains or in other parts of northern India. Due to this pattern of distribution, “megalithic culture” tends to be equalled to “early pan-Tamil culture” in this kind of historiography. In contrast to this, the ideologistic Sinhalese counterpart likes to identify “Buddhist” with “Sinhalese” as quickly as possible, editing out contributions of Tamil-speaking Buddhists to their religion's history. Accordingly, the Buddhist stupas of Kandarodai alias Kadurugoda alias Kadiramalai are interpreted as evidence of Sinhalese predominance in the core region of Jaffna Peninsula in the first millennium. The diverse narratives are even reflected in two different Wikipedia articles on the very same subject. Both of them are obviously biased. Just compare Kandarodai (wikipedia) with Kadurugoda Vihara (wikipedia). The Tamil oriented article dates back the stupa buildings to the first centuries A.D., without any questioning. This early date allows both, to tie them more closely to the pre-Christian megalithic culture (what is done explicitely in this Wikipedia article) and to harmonize them with South Indian history by attributing them to the pre-Pallava period (this is to say implicitely: before Hinduism became predominant in Tamil religious history due to the conversion of King Mahendravarman I of the Pallava dynasty from Jainism to Shivaism under the guidance of Appar, who is the most influential Tamil poet-saint.) On the other hand, the Sinhalese oriented article mentions nothing else than Buddhist findings, though there were significant pre-Buddhist excavation finds in layers below the Buddhist remnants and, apart from that, a plaque depicting the Hindu goddess Lakshmi. Punch-marked coins are also clues indicating that Kandarodai must have been in close contact with coastal areas in southern India. - Half-truths, of course, are well-established means of propaganda, of religious and other ideologies, all over the world. Due to this ideologically determined controversy, we, as non-historians, are not at all able to identify the true version of the story of Kandarodai, since even basic data are disputed or questionable, at least some of them: What were the findings at this site? Where can they be seen today? What exactly was written in inscriptions found here? The name of the Buddhist temple, which was re-established in Kandarodai or Kadurugoda, is Purana Maharaja Vihara, which simply translates to “Old Royal Monastery”. Probably, there had been a Buddhist monastery at this site in the long period from the first or second till the early colonial period. 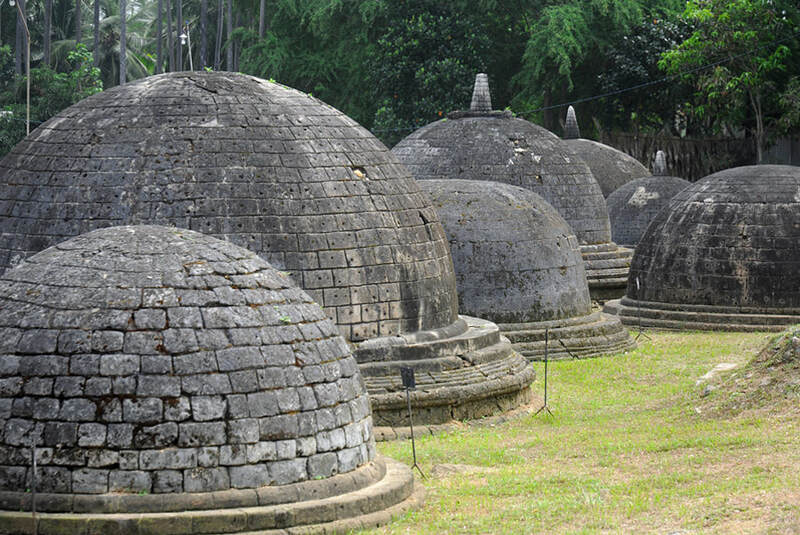 What can be seen today – and what is really impressive indeed, despite of the small sizes – are 20 semi-spherical limestone domes of stupas, the largest of them measuring 7 m in diameter. The stupas are reconstructions from the second half of the 20th century, they were built by the Archaeological Department. In the original state of the ruined complex, there were only circular foundations made of stone. It’s likely, they one carried small mounds at least, maybe even domes. Altogether five dozens of them were discovered in 1917 by Paul E. Pieris, then judge in Jaffna. 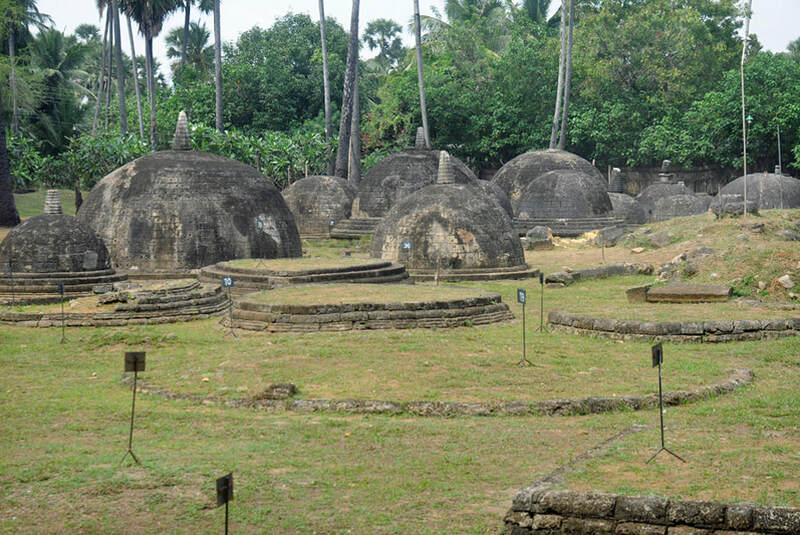 No other site in Sri Lanka has yet been excavated with such a large number of stupas. It’s not unlikely they were burial places of monks, similar to Alahena Pirivina in Polonnaruwa. However, it’s also possible they sheltered votive offerings. The stupas are from the Anuradhapura period, but it’s not entirely clear, in which century they were constructed. Maybe more and more of them were built in the course of time. The most renowned historian in the early years of Ceylon’s independence, Senarath Paranavitana, suggested the constructions to be influenced or even initiated by a prince of the Shailendra dynasty (ca. 760 till 860), which is famous for having constructed the Borobudur in the island of Java. The large number of stupas on the upper Borobudur levels is determined by Vajrayana teachings. Vajrayana occured in Sri Lanka in the 8th century, too. However, the number of mini stupas in Kandarodai cannot be proved to be that of the Borobudur, 72, even if originally more stupas existed than can be identified today. There is reason for doubt: Not the large number is the Borobudur’s main Vajrayana characteristic but the circular arrangement. The Borobudor is a arragend three-dimensional Mandala, perfectly symmetrical, and this is of utmost importance for its architectural concept. In contrast to this, there is obviously no geometrical groundplan for the arrangement of the Kandarodai mini stupas. Paranavitana’s highly controversial theories of Malayan or Indonesian influences and the very vague similarity to the Borobudur (consisting only in the large number of stupas) are the reasons why many guidebooks and online articles date the Kandarodai monuments to the 8th or 9th century. Actually, there is not more evidence for this dating than for the other: Some stupas in Kadarodai may well be more than 2000 years old. At least, Buddhist presence at such an early stage is suggested by the finding of a Brahmi inscription (from about 200 B.C.) probably referring to an alms bowl. In case the stupas are from the earliest period of Buddhist presence at this place, they are among the most ancient relics of buildings in Sri Lanka. There are only few examples of original structures surviving from pre-Christian centuries, for example the much larger Kanataka Chetiya and Mihindu Seya in Mihintale. In 1967, an expedition of the Smithsonian Institute excavated potsherds similar to pottery of the megalithic cultures of southern India and, though presumably from a later period, the plaque depicting Lakshmi. Archaeological surveys in the vicinity indicate: In the mid first millenium B.C., Kandarodai was not only a religious sanctuary, it was an agglomerate of settlements covering an area of 16 hectares, in Sri Lanka only second to contemporary Anuradhapura. The first phase of the Kandarodai settlement is defined by presence of Black and Red Ware (BRW) as well as Painted Grey Ware (PGW), found in layers dating to the 5th till 2nd centuries B.C. This pottery is quite similar to the ceramics excavated in Anuradhapura. Remarkably, Tamil Brahmi scripts from 300 B.C. were discovered on Black and Red Ware potsherd in Kandarodai. They are among the oldest specimen of the Tamil variant of Brahmi. For comparison: Megalithic cemeteries in the northern half of Sri Lanka are usually dated to the 8th till 4th century B.C. Megalithic funerary architecture in India began about 1100 and lasted to 100 B.C. PGW is the key indicator ("fossil artefact") of early Iron Age settlement in the plains of the River Ganges. But it was widely distributed all over northern India (found at 700 places), though not predominating at those excavation sites that are situated farer away from the Ganges. PGW was produced between 1200 and 600 B.C. as deluxe table ware. PGW pots found in southern India and Sri Lanka are probably imports. Production of variants of PGW may have continued in the area the northern tributaries of River Ganges till the first half of the first millennium. But usually they are produced not later than 500 B.C. The Black and Red Ware (BRW) is slightly earlier but also contemporary to Painted Grey Ware (PGW). Production of BRW is dated roughly to the 12th till 9th century B.C. The main distribution area of BRW is the Ganges area, too, but downstream, further east. The megalithic culture in Southern India and Maharashtra has been associated with the adoption of BRW and iron objects. This does not mean, they were BRW cultures of North-Indian origin, they were only influenced by them. And iron production may have been begun even earlier on the Indian peninsular than in northern India. It’s possible or even likely that Dekkhan Indian iron age cultures were not dispersions from those of the Middle East but invented the technology independently.